I met Andy Warhol in the early 1960s at the "Factory" on East 47th Street, New York City, where he painted, interviewed, accepted visitors, and hangers-on. Andy often said, he would believe he made it, when his paintings were in the permanent collection of Museum of Modern Art, affectionately known as MoMA. Sadly the painting was acquired after his death in 1987. Photo, right, Anna. 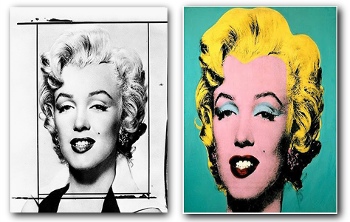 left, pop artist, Andy Warhol. Read my novel when Anna, a Marilyn Monroe double visits Warhol's first gallery opening in New York, exhibiting the Marilyn Monroe paintings, and discover her shocking reaction. In my historical novel, Anna, the fictional character arrives in New York in 1962, and hopes to rekindle her friendship with her childhood playmate, Pop Artist, Andy Warhol, but ends in disaster. Above. Black, and white head shot of Marilyn Monroe, the publicity photo from the film "Niagara." Andy Warhol used this photograph for his Marilyn Monroe paintings, hanging in the Museum of Modern Art in New York. Iconic 1962 video of Marilyn Monroe singing "Happy Birthday" to President John F. Kennedy. 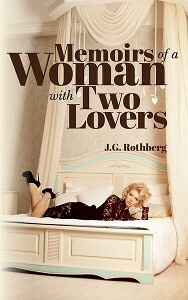 "Memoirs of a Woman With Two Lovers," is about Anna, a Marilyn Monroe doppelganger. Anna moves to New York to rekindle a childhood friendship with Pop Artist Andy Warhol, but encounters disaster. 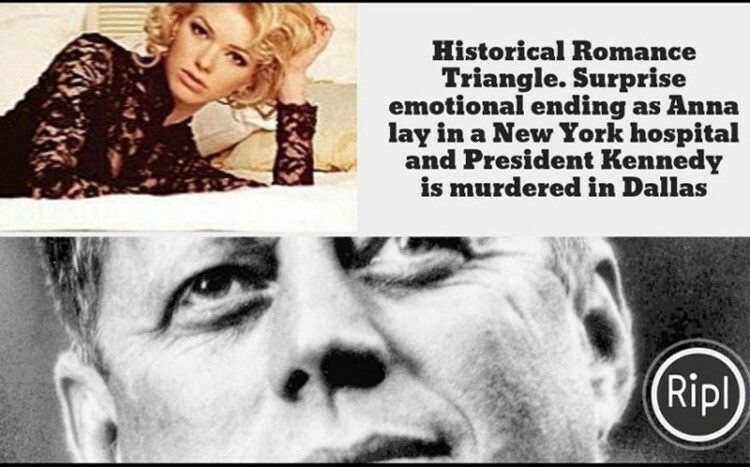 My historical romance novel ends with an emotional bang, as Anna lay in a coma in a New York hospital, and President Kennedy is murdered in Dallas. I'm J.G. Rothberg, founder of Circus Magazine, the legendary rock and roll publication, and have been its editor and publisher for forty years. I've lots to tell you about my new historical novel, "Memoirs of a Woman with Two Lovers," which will satisfy the appetites of those who desire to read about the changing American Culture of the 1960s. I follow one woman, Anna as she winds her way through the world of Pop Art, celebrity, and political icons. Anna arrives in New York, hoping to rekindle her childhood friendship with Pop Artist Andy Warhol. She soon becomes a Marilyn Monroe doppelganger, but fears for her life when she learns of the rumors of an alleged love affair between Monroe, and President John F. Kennedy . "Memoirs of a Woman with Two Lovers" sums up the conflicting emotions of the time, bringing together its idealism and its darker side. You especially won't want to miss how it ends! "Memoirs of a Woman with Two Lovers"
Now as a Monroe double, she makes forays into music clubs in Greenwich Village with both her lovers, to taverns, and to watering holes, Anna elicits stares, and whistles as a Monroe doppelganger. At a Taylor Mead poetry reading, a transvestite grabs her crotch, and is surprised she is the real gender: a woman. A young man arrives toward the end of the enigmatic novel, a friend of Nick's from rehab, a musician, and guitarist who claims he's Andy Warhol's son, exploding another element to the story. We learned from the very first pages of Anna's childhood friendship with Warhol, that she had given birth to a boy, when she was sixteen, with the infant immediately sold for adoption. A life event Anna agonizes over throughout the pages of the novel. This historical novel, "Memoirs of a Woman With Two Lovers," is the author's third and most provocative novel, yet. You hold your breath; the pages fly and you are immersed in this roller coaster ride, down the slippery slope of a romance for all of us, and for all times. Coming soon my fantasy novel, "Billy B. Gude, and the Escape from Elsinore Castle." You may also remember me from Circus Magazine, America's cutting-edge rock music magazine that covered the rock 'n roll industry for over four amazing decades. I was the founding publisher and editor of Circus Magazine here in New York City, where many fantastic music journalists got their starts. The magazine reached a lot of teenage readers, and young adults in those days with some of the best rock journalism ever produced. Photo of author J. G. Rothberg, founder, editor-publisher of Circus Magazine, and the cast of the Broadway musical, "Hair" in No Smoking Campaign for American Cancer Society. I've authored three novels: "The Esau Swindle", "Love Song for Montana Greene", and my latest, "Memoirs of a Woman with Two Lovers". Now that I've turned a page in my career, I invite you to check out my latest novel — order it today from Amazon Books, Barnes & Noble, or other fine booksellers.